Four weeks into the college football season Little Giant Stadium has yet to be flooded in a sea of scarlet. That will change Saturday when Wabash plays host to Allegheny College. Wabash comes in to the game after last week’s 2-0 conference victory at Denison. Saturday will be Community Day with the Crawfordsville High School Band marching at halftime. 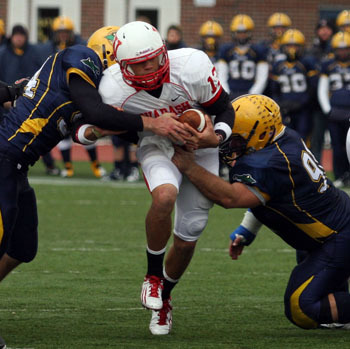 Allegheny is 1-1 after suffering a 30-point thrashing at the hands of Carnegie Mellon – Wabash’s homecoming opponent next week. The Gators have had two weeks to chew on the loss due to the bye week. The Little Giants defeated the Gators 22-16 in a late-season battle last year. The win was Wabash’s closest regular season game. Allegheny will look to ground and pound in a battle of strength versus strength. The Gator’s physical running game will go against a Little Giant defense that is allowing the second fewest rush yards-per-game in the nation. Down and distance will be an important factor for both team. Wabash’s defense has also excelled at creating turnovers. The team has a plus-6 turnover margin which is the third best in the country. Hodges already has four interceptions in just two games including one he returned for a touchdown at Hanover. He too has taken notice of Allegheny’s quick passing game. With the third-and-longs come the big play opportunities this defense has thrived on so far, but Hodges still sees room for improvement. Hodges looks to continue being a menace to opposing quarterbacks. Obviously, four picks is not enough. Allegheny has a veteran defense with six seniors starting. The unit is led by Honorable Mention All-Conference safety Ryan Vietmeier and linebacker Bill Devlin. The Wabash offense has benefited from the senior leadership of quarterback Chase Belton in the first two games. He accounted for three touchdowns last week while throwing for over 200 yards through. He did so in a liberal fashion, completing the ball to eight different receivers. The running game was effective last week too. 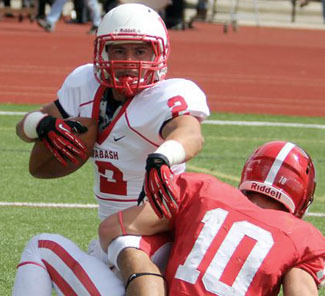 Wabash passed the century mark and provided great balance to the offense. Raeburn called 30 run plays and 30 pass plays at Denison. The team acknowledges the competition is getting stiffer, starting this week with Allegheny. “This is our first real test,” Hodges said.